The barber pole has a wonderful and interesting story to tell, and its presence keeps this story alive. It is the oldest distinguished mark of any profession or craft, dating back before the birth of your boy, Christ. History tells us that barber service was rendered to the public 6,000 years before. The art of hair and beard trimming (barbering), medicine (herbs), dentistry (tooth pulling) and surgery (blood letting) were all performed by the same operators in the early history; they were called BARBER SURGEONS. Due to the services that they rendered and especially to the royalty, the barber-surgeons were the most respected and protected men living. They held this respect for thousands of years. During their practice of surgery, which consisted only of blood letting or bleeding the disease, a white cloth was used. They would rinse this out leaving blood stains, hang it in the door-way of their business to dry. As the bandages blew in the wind, they would twist together to form the spiral pattern similar to the stripes in the modern day barber pole. The barber pole became emblematic of the barber/surgeon's profession. Later the cloths were replaced by a painted wooden pole of red and white stripes... thus, the origin of our present day barber pole. The original pole had a brass basin at the top - representing the vessel in which leeches were kept - and bottom - representing the basin which received the blood. The pole itself represents the staff that the patient gripped during the procedure to encourage blood flow. As the years passed by the hundreds, this original badge has been changed to the present, attractive glass red and white emblem which represents professional grooming service. The doctors, the dentists and the surgeons have all branched from this original profession long since; however, the barber pole still remains the property of the artistic barbering profession. After the formation of the United Barber Surgeon's Company in England, a statute required the barber to use a blue and white pole and the surgeon to use a red pole. In France, surgeons used a red pole with a basin attached to identify their offices. Blue often appears on poles in the United States, some suggest as an homage to its national colours. Another even more fanciful interpretation of these barber pole colours is that red represents arterial blood, blue is symbolic of venous blood, and as I've said, white depicts the bandage. Legend has it that in South Korea, a single Barber's Pole indicates there is a massage parlour located in the building. If there is a double Barber's Pole, this indicates that the massage parlour provides "extra service". Hey now! A spinning barber pole is the basis for a famous motion perception illusion, in which the stripes appear to be traveling down the length of the pole, rather than around it. The "barberpole illusion" is a visual illusion that reveals biases in the processing of visual motion in the human brain. When a diagonally-striped pole is spun around its vertical axis (horizontally), it appears as though the stripes are moving in the direction of its vertical axis (downwards in the case of the animation to the right). Rather than being perceived as rotating, the viewer will have the illusion of ascending or descending stripes (depending upon the direction of spin). This illusion occurs because the perception of motion is biased in the direction of the longer (in this case, vertical) axis. 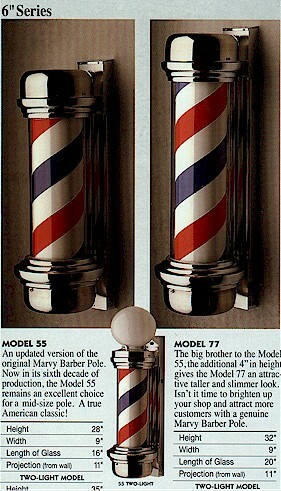 In 1950, William Marvy of St. Paul, Minnesota started his barber pole manufacturing business. Mr. Marvy made his 50,000th barber pole in 1967, and by the early part of 1996 over 74,000 poles had been produced. Marvy is the sole remaining manufacturer of barber poles in North America. In recent years, the sale of spinning barber poles has dropped considerably, both because very few new barber shops are opening and many jurisdictions prohibit moving signs of any kinds as unsightly or visually disrupting. CHECK THIS OUT, YO. POST IT IF YOU LIKE. SO COOL. 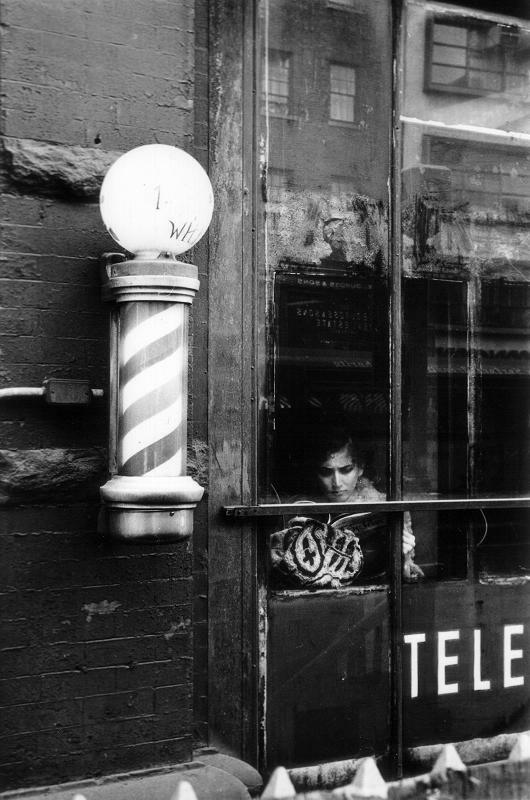 by the way, this barber pole story is so great. i really, really, loved it. Who goes there? Frida, is that you? yes, of course it's me. i go under anonymous because i'm too lazy to set up an account.